Common only in desert regions and locally in coastal southern California, the long-nosed snake is uncommon in the interior Coast Ranges and the adjacent floor of the Central Valley from Sutter and Butte cos. south. This species ranges widely in southern California and is known from desert regions east of the Sierra and Cascade Ranges north to the Oregon border. A snake primarily of grasslands, arid brushlands, and coastal chaparral, the long-nosed snake is not expected in forested types. Elevation sea level to 1620 m (5400 ft). Feeding: Long-nosed snakes prey heavily on lizards but also take rodents and other small prey. Stebbins (1954) listed mammals, lizards and lizard eggs, and insects as among the food items taken. Captive individuals have also eaten small snakes. Cover: Seldom found under surface objects, long-nosed snakes are good burrowers. Nussbaum et al. (1983) report that disturbed individuals burrow rapidly into loose soil, and that they often lie covered with sand with only their head exposed. They may also seek cover in rock crevices (Stebbins 1954). Reproduction: Little is known about habitat requirements for reproduction in this species. Females are thought to deposit egg clutches in loose, moist, well-aerated soil. Abandoned mammal burrows may also be utilized as nest sites. Water: No information on water requirements. This is a snake of arid lands, seldom encountered near stream courses. Standing water is not an important habitat element. Pattern: Inhabits deserts, plains and brushland, seldom found near water. Activity Patterns: Nocturnal and crepuscular, occasional diurnal activity has been reported. Individuals are most commonly encountered from April thru June (Klauber 1941). A period of winter inactivity occurs at all localities. Reproduction: Five to 8 eggs are deposited in July. Hatchlings emerge in late August or September. Niche: Long-nosed snakes appear in the diet of hawks (Nussbaum et al. 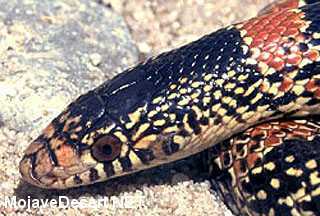 1983), and they are taken as prey by other snakes (Cunningham 1959). Competitive interactions between this somewhat fossorial species and other snakes (some of them also good burrowers) with which they co-occur are largely unknown. Diller, L. V., and R. C. Wallace. 1981. Additional distribution records and abundance of three species of snakes in souwestern Idaho. Great Basin Nat. 41:154-157. Klauber, L. M. 1941. The long-nosed snakes of the genus Rhinocheilus. Trans. San Diego Soc. Nat. Hist. 9:289-332. Medica, P. A. 1975. Rhinocheilus, R. lecontei. Cat. Am. Amphibians and Reptiles. 175.1- 174.4. Distinguishing sharacters: A slender species; cream ground color; black dorsal saddles with red interspaces; cream or yellow venter; black spotting on a white head; black saddles speckled with white on the sides; very pointed snout; countersunk lower jaw; anterior portion of subcaudal scales undivided in most individuals. Juveniles: Banding more pronounced; speckling on sides faint or absent. Similar species: Lampropeltis getula: Have banding completely around body; all subcaudals divided; rounded snouts; lack countersunk lower jaw. Additional notes: A gentle species that vibrates tail when annoyed. Some individuals may hemorrhage from the cloaca and excrete musk when handled.